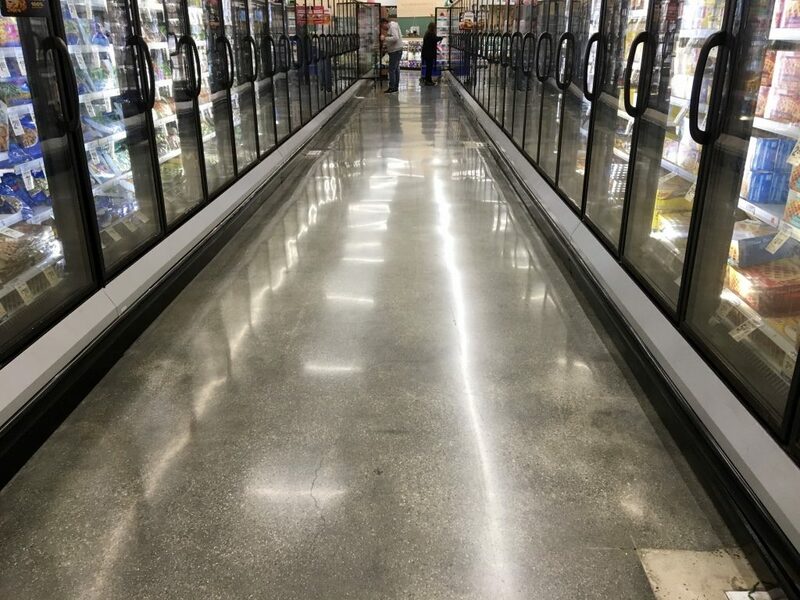 Can polished concrete floors be slippery when wet? Several web sites say yes, but others (mostly polished concrete vendors) say no, it only looks that way. A study of polished concrete published by the American Society of Concrete Contractors (ASCC) in Concrete International shows wet dynamic coefficients of friction (DCOF) as measured by ANSI A137.1 that are well above the 0.42 minimum specified by that standard: very high gloss surfaces had DCOFs of roughly 0.50, and low gloss surfaces had DCOFs of roughly 0.57. 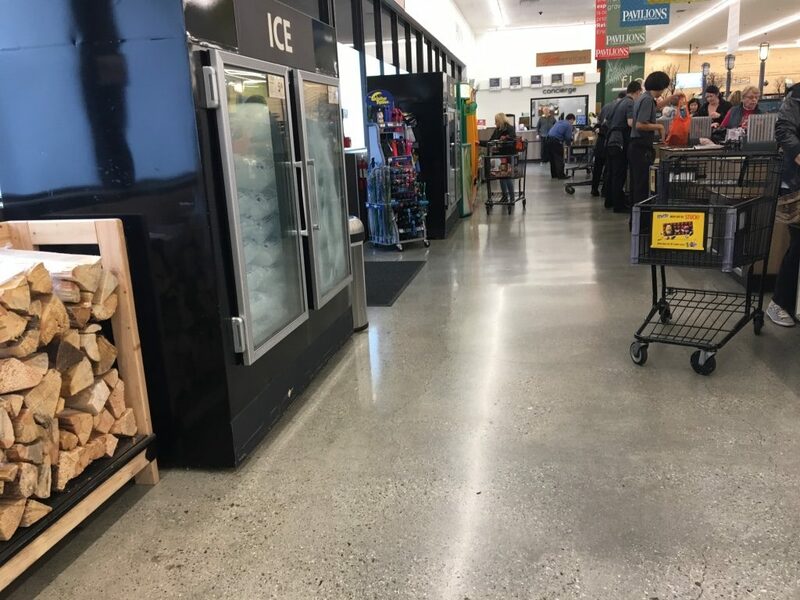 We think these may be misleading, and that polished concrete can be quite slippery when wet. 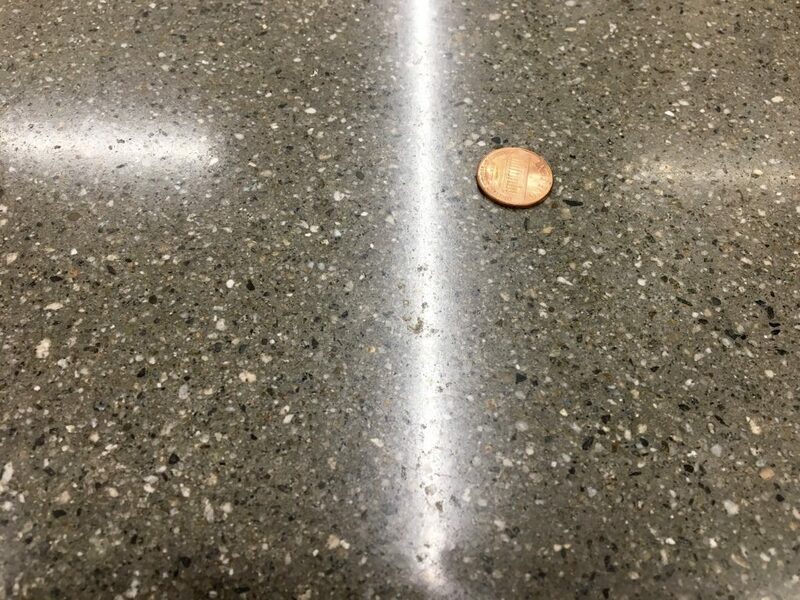 In the United Kingdom, reportedly most polished concrete floors fail the government-backed, long-accepted minimum of a wet Pendulum Test Value of 36. The British multinational DIY and home improvement retailing company B&Q have stopped polishing their polished concrete floors. Mitchells & Butlers, who own more than 1700 pubs, stopped using polished concrete (as well as polished terrazzo). London Underground is no longer installing polished concrete flooring. Over the past few years, our company has tested a number of polished concrete floors using both the pendulum and the BOT-3000E digital tribometer. We tested 200–800 grit finishes as well as matte finish, and with different types of sealers. We have come to a number of conclusions based on this work. Wet dynamic coefficient of friction (DCOF) from the BOT-3000E, using ANSI A137.1 or A323.7 test method, did not correlate with wet Pendulum Test Value (PTV) using a hard rubber slider (Standard Shoe Sole Simulating rubber, also known as Slider 96). Wet PTV correlates fairly well with total mean peak-to-valley surface roughness (Rtm), measured using the Surtronic 10 digital profilometer. Wet DCOF did not correlate with Rtm. The Rtm of the samples tested was 4–10 microns (25 microns = 0.001 inch). Generally, floors with “low slip potential” have Rtm exceeding 20 microns, and floors below 10 microns have “high slip potential.” The surfaces we tested also felt very slippery wet qualitatively, as judged by using heavily treaded shoes and/or experienced, educated bare fingers. The wet DCOF of the polished concrete we tested (using ANSI A137.1) was in the range 0.41–0.75, a larger bracket than the 0.47–0.58 of the ASCC study. All the PTV’s tested were in the range 7–10, indicating “high slip risk”. All the surfaces we tested were slippery when wet as indicated by (1) wet PTV, (2) Rtm, and (3) qualitative judgment. Why the disagreement between BOT-3000E and pendulum? One possible reason is that the BOT uses a slider rubber, SBR, that is harder even than the pendulum’s hard rubber slider, and the harder SBR rubber may penetrate the water film to make better contact with the floor beneath. This perhaps bodes well for stiletto heels, but not for the wider range of heel materials in American shoes such as womens’ casual shoes and athletic shoes or trainers. On the single polished concrete that we tested with hard and soft rubber sliders on the pendulum, there was negligible difference between the two: hard rubber gave PTV = 8, soft rubber PTV = 9. Two-thirds of the samples we tested had wet PTV less than 12, which may make them unsuitable for even dry areas due to potential contamination by dust, tracked-in parking lot grease, etc. The remainder of the samples had PTV≥12 and dry PTV of 63 or higher, indicating that they are slip-resistant to most footwear when dry. This is why we recommend using situation-specific recommendations based on Pendulum Test Value that have been in use since 1999. Wet slip resistance of polished concrete is best assessed using the pendulum tester. In areas that may get wet in use, SparkleTuff™ durable transparent abrasive coating from Safety Direct America gives excellent wet slip resistance under all conditions while retaining the high-gloss look. 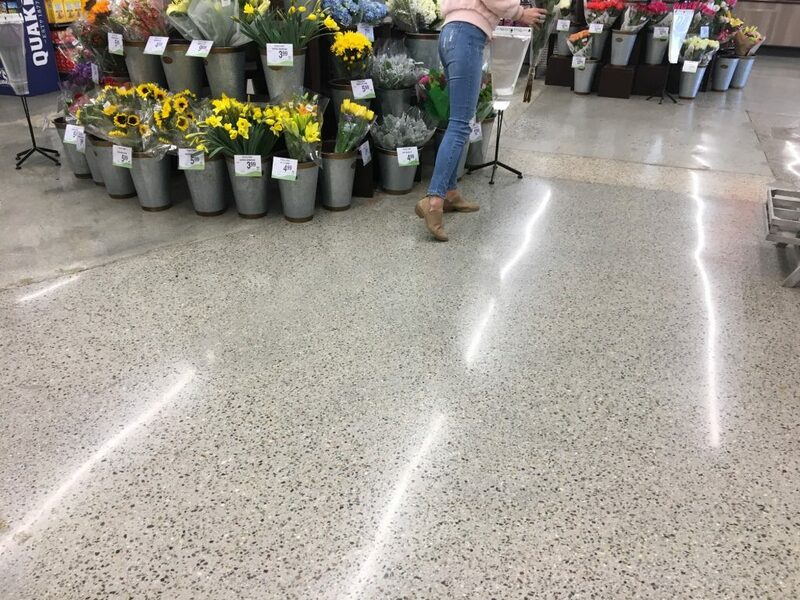 The photos below show some polished concrete surfaces in a supermarket.